Welcome to the Buddha Land of Arakan | The land which is known as "Arakan" by the foreigners is called by its own people "Rakhaing". The word "Rakhaing" is derived from Pali word "Rakkha Pura", the village of "Rakkhas". Vesali is one of the oldest ancient cities in all of Burma, dating from AD 327 to AD 1018. It was founded by Dvan Chandra who, according to an Anandacandra Inscription from 729 AD, was believed to have been a descendant of the Hindu god Shiva. Vesali is noted for being the first Arakanese kingdom to use currency, almost a millennium before it was introduced by other civilizations in Burma. Gold and silver coins, inscribed with the Chandra dynasty emblem and the word “king” in Sanskrit have been found and dated back to the Vesali era. The Vesali kingdom had a far-reaching trade network, exporting goods to the Arab and Persian kingdoms and beyond. From 794 AD – 1413 AD several Arakanese capitals were founded along the Laymro River. The first, Sambuwauk, was founded by King Nga Tone Munn, who was the son of the last king of Vesali, Sula Chandra. In 818 AD his second cousin Khattathun seized the throne and moved the capital to Pyinsa, where it stayed for 285 years. This pagoda is situated on the top of Andaw mountain where is in the left river bank of Thandwe river and one mile far from Thandwe. The governor Za Choke of the city of Dawrawaddy, built the pagoda enshrining the molar relic in 762 AD according to Buddha’s porphecy. Rakhine successive kings such as king Maha Soe, king Ra Zar Gyi and king San Da Thu Dham Ma, renovated it. The residents of Thandwe and Andaw villagers renovated the pagoda again in 1870 AD. The form of Andaw pagoda is octagonal in shape at the base. The pagoda measures 46 feet high and 244 feet in circumference. The upper part of the bell-shaped deom is conical. The whole pagoda doesn’t have any decorations and the pagoda court is also narrow. There is the small bell in the north-east of the pagoda court and the stone slab which is 15 feet in circumference, is at the eastern cliff of the mountain outside the pagoda court. That stone slab is a part of the umbrella of the ancient pagoda. The square-formed hole was made at the centre of the stone slab. Each side of the hole in the form of square, is 2 feet 2 inches in length. The square-formed hole of the stone slab, was used for the inner central pillar of the pagoda. There is a prayer hall at the base of the mountain. The Buddha image which is made of bricks and cement, is dwelling in the prayer hall. U Shwe Bu, the lieutenant general of Myanmar force, built the prayer hall in the peace of the ancient religious edifice in the early 19th century. The design of the prayer hall is strange because the design of the common Buddhist building and the design of the islamic mosque, are mixed up. The prayer hall is called Pharahla. There is a corridor to enter the hall in the form of square, and the ceiling was made in the form of dome. The governor Min Nyo Khin of the city of Dawrawaddy built the pagoda in AD 784 according to Buddha’s prophecy. 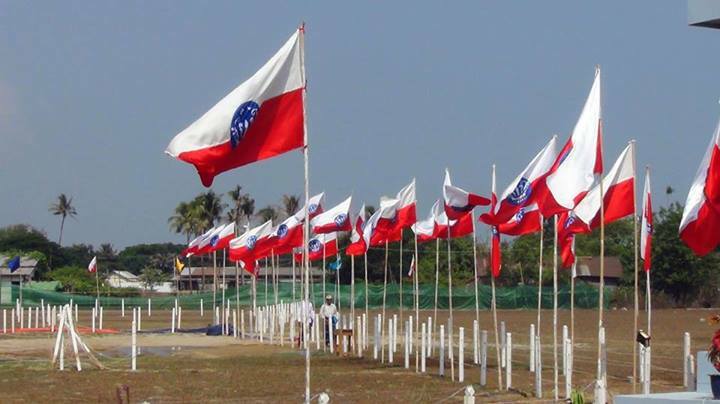 Rakhine successive kings such as king Maha Soe, king Ra Zar Gyi and king San Da Thu Dham Ma renovated it. The residents of Thandwe renovated it again in 1849 AD and 1876 AD respectively. The form of the pagoda is octagonal in shape. It measures 65 feet in height and 180 feet in circumference at the base. The upper part of the bell-shaped dome, is conical and there are no decorations, caves and porches. The pagoda court is enclosed with the octagonal-shaped wall. There are three entrances around the wall, but only one entrance has the brick stairway. The brick stairway provides an access to the pagoda from the base of the mountain. It has 204 steps and the balustrade of the stairway is 3 feet high. The small bell is in the north-east of the pagoda. The contemporary religious buildings are occupying the base of the mountain. Among them, the distinctive building is the building in the form of the cave cemetery of the Mohanmedan. The inner room is square, and the roof and the ceiling are spherical. King Athor Ka of Padalipoat kingdom excavated seven Sarwat at Buddha relics king Azar Ta That buried in Razargyo kingdom. Sarwat is a container (the unit of measurement). In accordance with the advice of monk Shin Maha Mauk Ga Li Poat Tiek Tha, he sent the Buddha relics to the Buddha’s prophetic places for building the pagodas. King Thu Ri Ya Sak Ka of Dynyawaddy kingdom and king Athor Ka, were simultaneous kings. King Athor Ka ruled his country from BC 326 to BC 286. King Thu Ri Ya Sak Ka ruled Dynyawaddy from BC 316 to BC 272. King Athor Ka sent monk Shin Bar Ku La and monk Shin Maha Teik Tha bringing Buddha relics to king Thu Ri Ya Sak Ka to build the pagodas in the prophetic places of Buddha in Dynyawaddy. 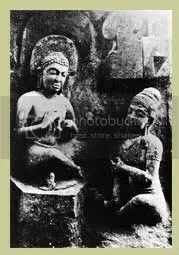 The two monks gave him the Buddha relics and the replica of Sandamuni Buddha image which Buddha cast by himself while he was alive. According to the two monk’s instruciton, he built 248 pagodas int he prophetic places of Buddha who visited Rakhine. The pagodas were as high as the bull. The successive kings of Rakhine reconstructed them into the larger pagodas by encasing the original pagodas.